This simple and elegant combination invites your guests to assemble their own appetizer. Serve with sparkling wine, martinis, or cold vodka — perhaps one infused with cucumber or lemon. In a smallish bowl, whisk together the crème fraîche with the horseradish and chives; season to taste with salt, pepper, and a splash of vinegar. 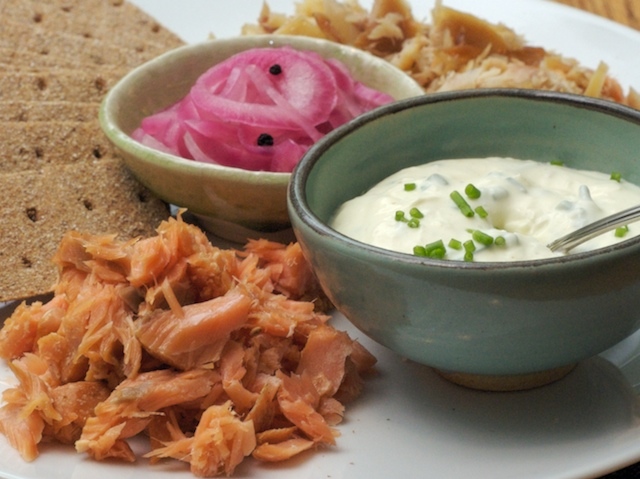 Arrange the smoked fish, pickled onions, and rye crackers on a large platter; place the crème fraîche nearby. To serve, place a lump of smoked fish on a cracker, drizzle with the seasoned crème fraîche, and top with several pickled onions. Variation: If you're lucky enough to have smoked trout on hand, substitute it for the salmon. If fresh horseradish is not available, substitute prepared horseradish, adding half the suggested amount and tasting first before adding more. If the bottled horseradish is packed in vinegar, you probably won't have to add any vinegar to the crème fraîche.